I made a lemon cake with lemon filling. I used an eight inch, a six inch, and a four inch pan and buttercream them separately. Earlier I made some calla lilies and little white flowers out of fondant. I put it all together and put the little flowers with brushed on vodka and then the calla's on top with a couple of leaves. I had never made a wedding cake before, so I thought I would try a little one. It is just one cake mix and will serve twelve to fifteen people. I am a friend of Nancy from Rialto who made this incredible cake(s). She is so talented and creative it's hard to believe what she'll come up with next! Thank you, Nancy, for everything..
THAT'S GREAT!!!!!!!!!! WHAT A GREAT JOB! 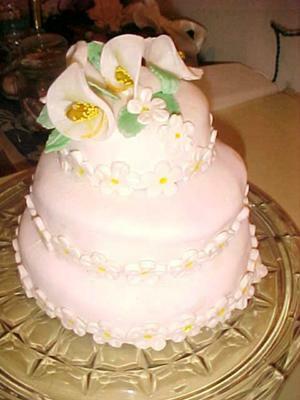 The flowers are very nice and you can make my wedding cake.....Nov. 2009! I took the class to learn wedding cakes and that wasn't included so I'm experimenting too.